It's rare to find running water easily accessible from UK summits, so I've really no choice other than to carry what I need. A 3 litre Source Widepac hydration bladder fits perfectly in my pack. I'll take water purification tablets as well, just in case. 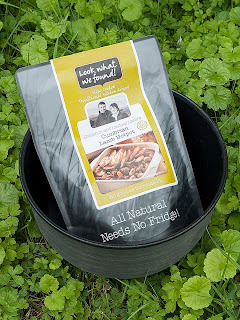 Food: evening meal will be one of the excellent Look What We Found meals, available from UK supermarkets or direct via mail order. Heavy, and there's not a huge variety in the range, but tasty and easy to prepare. I've tried a variety of camping specific ready meals, and so far nothing competes with LWWF meals! Breakfast will be a Pot Noodle or cereal bars, and I'll have a few of the latter spare just in case. It's important to keep your energy levels up, and I'm still surprised how time spent on a cold summit (especially if you are standing around waiting for the light) can increase your bodies' demand for sustenance. So, a good supply of cereal bars, jelly beans, fruit and nuts or chocolate is quite important. The trick here is to keep yourself energised and motivated for photography, without getting distracted by having to spend a lot of time preparing food. Talking about cold, a hat and gloves is essential, even in summer. I favour a thin pair of gloves (those grippy types with small rubber pads) and a pair of mitts to fit over the top. If you buy the mitts slightly over size, they are easier to pull off and on for photography.